Patents are a vital asset in the modern business world. They allow patent holders to introduce new products in to a market while deterring other market players from simply copying innovative features without making comparable investments in research and development. In years past, a few patents may have provided adequate protection. That is no longer the case. In today's world, it is critical that innovative companies protect the features of their products that give them a competitive advantage with a family or portfolio of patents that are strategically generated to protect the market position of the patent holder. A patent portfolio that deters competitors from introducing competitive products in a timely manner can be worth billions of dollars. Anything less than this is an expensive and possibly fatal distraction. 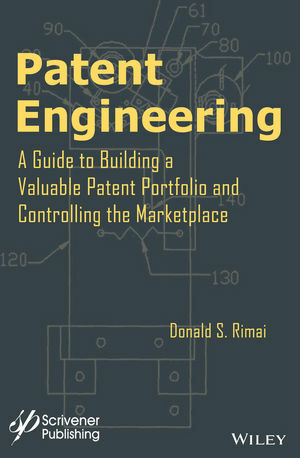 This book provides a strategic framework for cost efficient engineering of patent portfolios that protect your investments in research and development and that extend the market advantages that these investments provide. Dr. Donald Rimai recently retired from Eastman Kodak, where he worked as a researcher and intellectual property manager in digital printing and adhesion science. He is expert at developing patent portfolios and helping inventors patent their inventions. He is an Eastman Kodak Distinguished Inventor with 149 US patents. Don has published 5 books and edited two conference proceedings, is a Fellow of the Adhesion Society and of the American Physical Society, and has won the Charles Ives and Chester Carlson Awards. Don holds a BS from Rensselaer Polytechnic Institute and MS and Ph.D. degrees from the University of Chicago. In 2014 Dr. Rimai received the Inventor of the Year Award from the Rochester Intellectual Property Law Association.